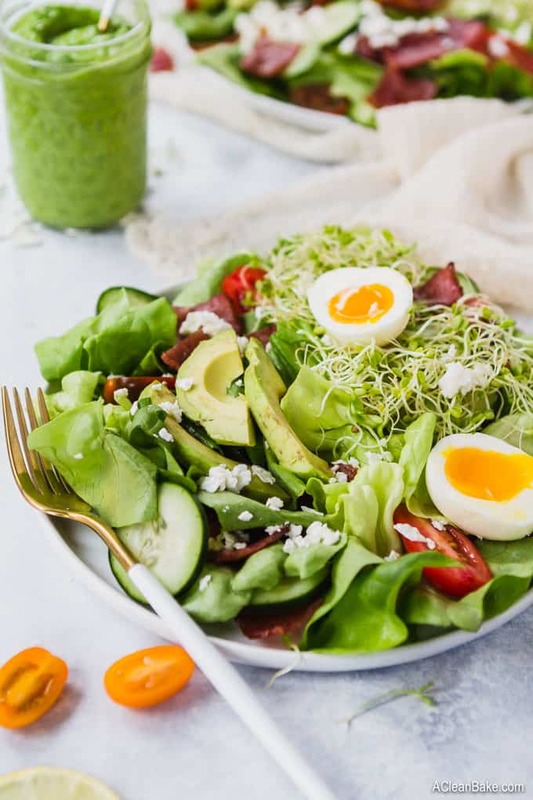 A cobb green goddess salad is a little bit of an unusual take on a classic cobb, but it’s definitely worth giving it a try. The salad is fresh, yet hearty, and the thick and creamy dressing is a vegan take on a classic green goddess dressing recipe. Once you try it, this healthy meal will become one of your go-to lunch recipes! 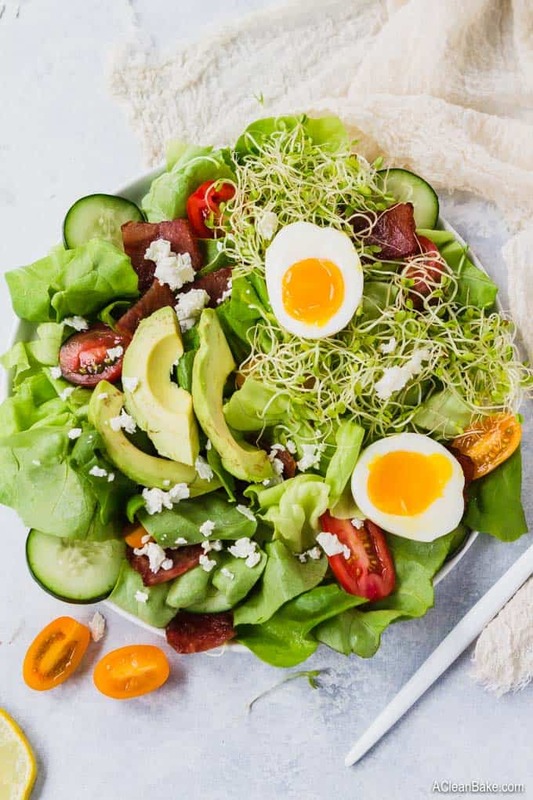 What is a Cobb Green Goddess Salad? OK fine. It’s a thing I made up. It started as a fridge clean out salad gone terribly right. 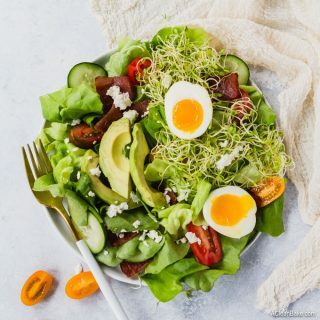 I tweaked a few things next time I made it, and eventually realized that it was a very green version of my beloved cobb salad. When I became so into cobb salads, I may never know, but that’s beside the point. …but they are all either easy to prep or prep-able in advance, so you’re not going to be spending two hours making a single salad. Classic green goddess dressing contains a lot of… stuff: anchovies or anchovy paste, mayo, and sour cream, to start. One look at those ingredients kind of makes my stomach turn. It’s just not my thing: too rich, fatty, and heavy for an already-hearty salad. It also typically contains several types of fresh herbs, which can really add up ($$), particularly this time of year. Instead, I only use parsley – and never miss the additional herbs. 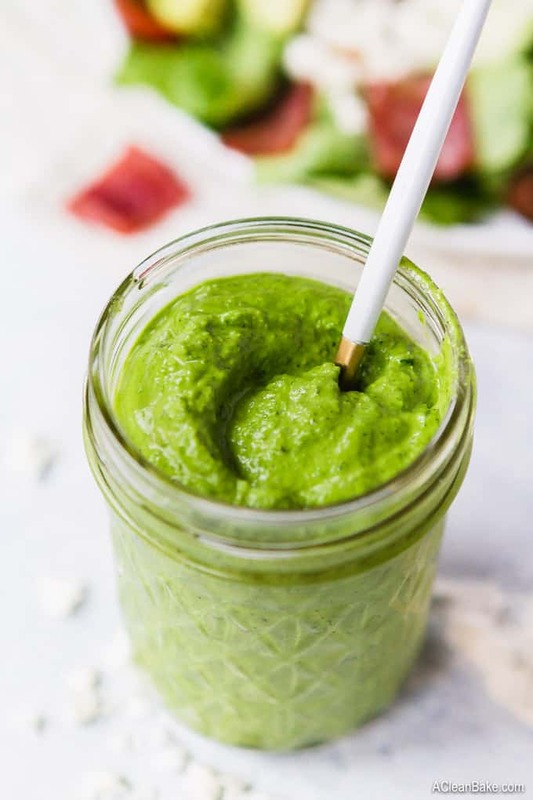 So, you’ll notice that the green goddess dressing in this recipe looks a little different from what you might have expected. It’s dairy free, vegan, and whole30 friendly. Don’t let the long ingredient list turn you off; it takes about a minute in the blender or food processor to prepare. Just put all of the ingredients in and give them a whirl. This recipe yields a lot of dressing, so you’ll either have a very well-dressed salad, or you’ll have leftovers for next time. You can use it to dress up (no pun intended!) any clean out the fridge salad – or even use it as a sauce for cooked chicken or pork. 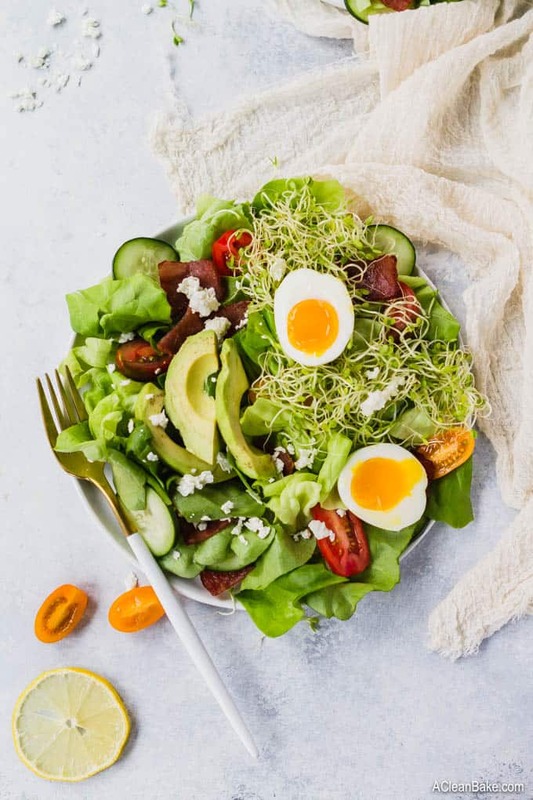 A cobb green goddess salad is a little bit of an unusual take on a classic cobb, but it's definitely worth giving it a try. The salad is fresh, yet hearty, and the thick and creamy dressing is a vegan take on a classic green goddess dressing recipe. Once you try it, this healthy meal will become one of your go-to lunch recipes! Divide the chopped butter lettuce between two large plates. Add half of the remaining salad ingredients to each plate, on top of the lettuce. Add all of the dressing ingredients to a blender and process until smooth. 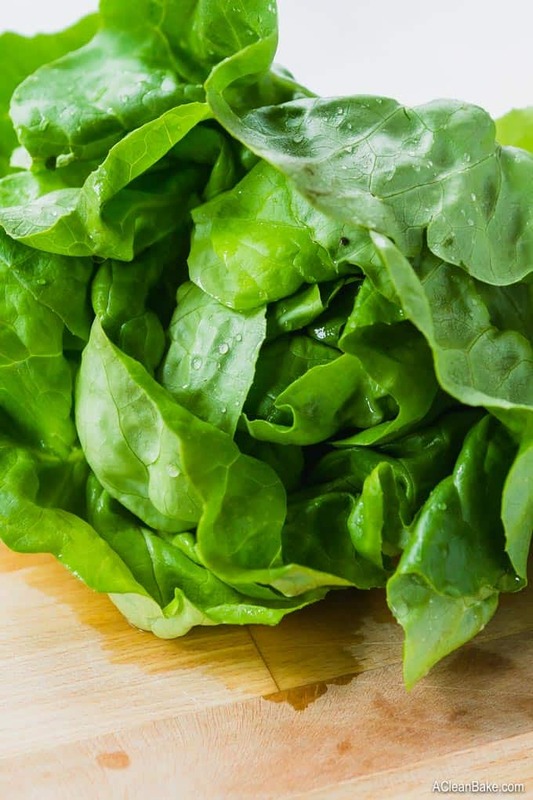 Dress each salad to your preference before serving. You can make the salad and store (undressed) a day in advance. This is the best soft boiled egg method I've tried. Store leftover dressing in an airtight container in the fridge for up to a week. This post contains affiliate links, which means that if you click through and purchase a product, A Clean Bake receives a small commission. 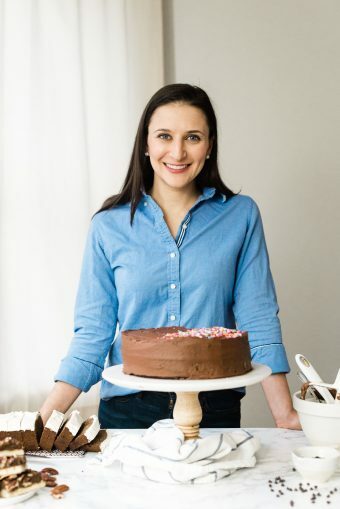 All proceeds go toward continuing to bring you delicious, healthy recipes every week, and this does not affect the price you pay. Thanks for supporting A Clean Bake!